When a plane passes over, do you wish you could be flying high above the ground, soaring like a bird? You can be. You can know the freedom that pilots experience as they travel the limitless sky, near the stars, clouds, and winds that encircle the earth. If you think that pilo ting a plane is only for those who joined the military or became commercial airline pilots, think again. You can be part of General Aviation – and it all starts with an introductory flight or scenic flight. And not only is flying fun, but it’s also efficient. Many trips that normally take a whole day by car can be made in half the time, or less, in an airplane. Piloting your own plane also increases the number of destinations you can reach directly by air. In the United States, about 800 airports serve commercial airlines, but more than 5,300 airports are open to General Aviation pilots. Beverly Flight Center is the North Shore’s premier flight school, a Cirrus Training Center, and FAA Part 141 certified. With 13 aircraft in our fleet, we provide quality flight training from your student pilot certificate all the way up to your ATP (Airline Transport Pilot). We are also a PSI testing facility for the FAA Knowledge Exams and also have a RedBird LD Simulator for ground training. Our fleet of aircraft consist of Piper Warriors, Piper Archer, PiperSport, Piper Arrow, Piper Apache-Geronimo (twin engine aircraft), Cessna 172, and two Cirrus SR20. 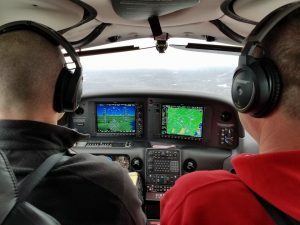 Start your Cirrus Transition Training today!